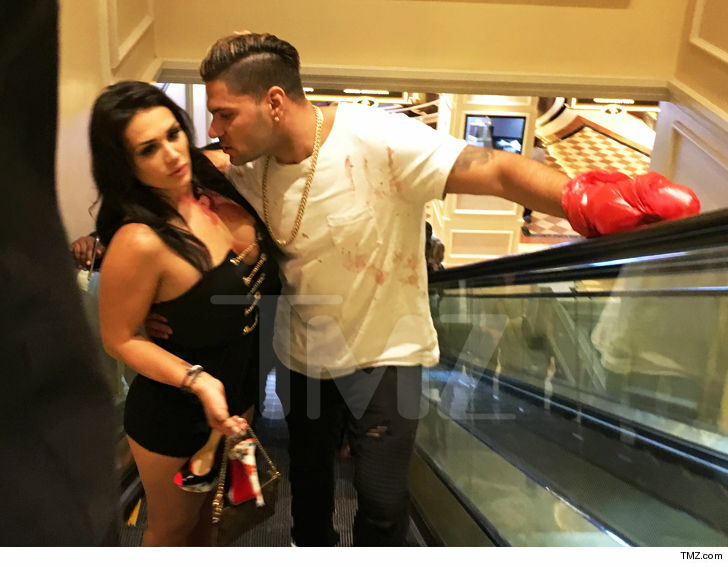 Ronnie Magro from 'Jersey Shore' needed stitches to repair his sliced and bloodied hand after a rough night in a Las Vegas club. TMZ obtained a shot of Ronnie's messed up left mitt -- he walked away from the fight with what looks like 5 lacerations. As we first reported ... Ronnie sustained the injuries early Friday morning in Tao Las Vegas. Sources connected to Ronnie say he was in VIP when a crowd spilled into the area around him ... and as he tried to shield her, someone threw a bottle or glass which shattered on his hand. A rep for Tao tells a slightly different story -- saying there were no other individuals involved, and Ronnie just accidentally broke a bottle in his hand. Either way, Ronnie didn't realize he was cut -- booze numbs, after all -- until his gf pointed out he was bleeding on her. Security at TAO gave him a few bandages and suggested he get stitches. He initially blew off that advice, but we're told Ronnie gave in Friday afternoon and got stitches.